Aislinn Rowntree is a mage whose gift allows her to empathically connect with and understand the nature of other living creatures; her talent as well as her compassion has made her a competent healer even though she has no innate magical ability to cure ailments, only a strong desire to help others and the medical knowledge that enables her to do it. Although she is married to the eldest son of one of the settlement's ruling families, her life in Dornie has not always been easy — she was forcibly integrated after a raiding party burned her village to the ground and killed most of its inhabitants, including her first husband and infant daughter, murders she may never find it in herself to forgive. Description: Blue eyes the colour of a cold and cloudy morning sky dominate Aislinn's face, which is winter-pale throughout the year and gently rounded with expressive ash brows and a small, shy mouth. The length of her hair, blonde and equally fair, demands special attention and care, and although her industrious lifestyle does not allow her much opportunity to give it, she maintains a semblance of order on her head by selectively weaving long sections of it into braids and using them to keep what she leaves wavy and loose from transforming into a wild nimbus in everything except the most blustery weather. Her frame is diminutive without being too slight and has a top half smaller in proportion to the bottom, with thin arms and hands that, although soft, are also worn and and callused in places where work makes her skin meet the most friction. She wears her nails short and her clothes plain, favouring neutral colours and natural textures with a strong tendency to put purpose and comfort before fashion. Aislinn was the first mage born in the Irish settlement of Killarney, County Kerry. Her father Cormac, the community's physician, and her mother Iona, its midwife, were already the parents of an unruly eight-year-old boy named Regan and hoped for a second child with a calmer disposition than their first. She did not disappoint them — Aislinn was a docile infant and grew into an obedient but perceptive little girl with a keen interest in her father's work. As soon as she was old enough and Cormac could convince Iona that it was appropriate, her father began taking her with him to calls in order for her to begin experiencing its reality from an early age instead of romanticizing him as some sort of savior. In Killarney, medical supplies were hard to come by, and in cases where his patients suffered from infectious diseases like tuberculosis, he lost more people than he was able to save, including Aislinn's own mother who succumbed to a lower respiratory tract infection a few months after her younger brother Davin was born. Although Cormac loved Aislinn very much, he was a man of science and medicine, and styled his philosophy around knowledge passed down to him by his mentor, who had been Killarney's acting physician before him. The Corall family was known for Cormac's extensive library of medical textbooks and journals published during the twentieth century, and for a long time he struggled to reconcile the religious beliefs he'd been raised to follow with a lack of evidence to support them — it was not until Iona's death that he made his final decision on the subject of God and the afterlife, and whatever it was Aislinn does not know. Cormac never shared it with any of his children, and instead encouraged them to arrive at their own conclusions, but when Aislinn's belief in an imaginary friend persisted into pre-pubescence he began to express concern. The other residents of Killarney were starting to worry as well, although for different reasons; Aislinn always had a reputation for being an intuitive child, but there were some who felt that she was more knowledgeable about things than anyone should have been, and began to raise questions about whether or not there was something wrong with her after she successfully predicted the sexes of eight children born in Killarney one year, including a pair of twins, and indicated which among them would not survive to see their first birthday. Two weeks before a cholera epidemic hit, she warned people that something terrible was coming, and after the last of the bodies had been buried, the settlement's surviving inhabitants confronted Cormac with the possibility that his daughter might have been the cause. While the people of Killarney knew of mages, no one with any authority could attest to ever having met one and acted based on the worst stories they had heard from travelers who passed through. The settlement's leaders told Cormac that he would have to send Aislinn away for everyone else's peace of mind and also for her own safety — those unable to come to terms with the loss of their loved ones, they said, might do something in the depth of their grief that they would later regret. Rather than lose his daughter, Cormac chose to relocate his family, abandoning their home, his library, and everything except what they could travel with in a wagon pulled by one horse. He was surprised when Murtagh Faolán, the younger brother of Cormac's own apprentice, offered to accompany them, claiming that he wished to see more of the world than just than just Killarney and the area that surrounded it. The Carrolls crossed the Irish Sea into Great Britain, hoping for a fresh start, and eventually settled in a community called Rannoch on the border between the Scottish Lowlands and Highlands where mages were still exceptionally rare. 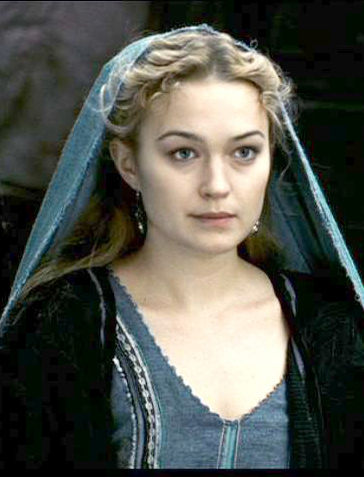 She became her father's new apprentice on the condition that she keep quiet about her gift, and fell in love with Murtagh, who found work as a hunter and furrier, while she was still in her teens, and although he forbade her from becoming sexually involved until she was married and from getting married until she was at least eighteen, she became pregnant when she was only seventeen, forcing Cormac to give the union his blessing. Aislinn should have been overjoyed — she was engaged to someone she loved and who loved her in return, with a child on the way — but the breach of trust created a rift in her relationship with her father that she was never able to repair, and when the child contracted meningitis and lost his hearing as an infant she believed that she was being punished for her disobedience. The boy, Colm, never had the opportunity to get to know his grandfather or his older uncle. Cormac passed away from injuries sustained from separating a fight between Regan and a romantic rival when Colm was only two, and although neither Aislinn or Davin blamed him for their father's death, Regan blamed Regan and left with barely a good bye. That same year, Murtagh proposed that he and Aislinn try for a second child. Aislinn agreed; with she and her husband both earning a good living, they could afford to care for another baby in addition to Colm even in spite of his disability as well as Davin, and a little more than nine months later they welcomed Saoirse Faolán into their family. For what felt to her like a very long time, Aislinn was content. She watched Davin grow from a boy into a young man, pursue relationships of his own, and eventually become engaged to the daughter of one of the community's leaders, but on the cusp of winter when Colm was five and Saroise a little more than a year old, Aislinn experienced a sense of foreboding with a kind of intensity she had not felt since her father's death, and before that the cholera epidemic that swept through Killarney. Afraid of being driven away from her new home the same as the last, she chose not to tell anyone. Just as before, her fears were well-warranted. A party of heavily-armed men from the north arrived at Rannoch, led by Duncan Rowntree, under the pretense of wanting to trade guns and ammunition in exchange for other supplies. An argument between the settlement's leaders and Duncan's men involving the terms of the bargain quickly escalated, and Duncan ordered massacre of the settlement's inhabitants so they could simply take what they had come to trade for. 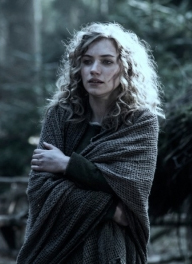 Murtagh was killed in the fighting, and Davin would have been as well if he hadn't been away at the time — Aislinn, Colm and Saroise were fortunate enough to find themselves among a pitiful number of survivors who Duncan decided to bring back to the north with him, but when he was told that Aislinn had both an infant and small child, he forced her to choose only one. It was the most difficult decision Aislinn had ever needed to make, and believing that Colm had a better chance of surviving the journey back to Duncan's home than Saroise, she gave up her daughter and her right to bury the body alongside her husband's. Rannoch was burned to the ground, and all the evidence of what happened there with it. Upon their arrival at Dornie, Duncan gifted Aislinn to his older brother Edmund, who took pity on her and allowed Colm to work for him as a stablehand so the boy could be closer to his mother. Grateful for the gesture, Aislinn gradually warmed to Edmund; he was not cruel to her, and while she might not have felt for him what she did for Murtagh, he was a reliable man who did not repulse her as Duncan did, and she decided there were much worse things than being his wife. In the years Aislinn has lived in Dornie as a Rowntree, she has come to love Edmund and given him a son, Ariel, and found that an attitude of prevailing sexism refers to her as a healer rather than the physician her father had been but does not much affect the amount of respect she receives for her occupation. She is a valued member of Dornie's community on her own merits and her opinion sought in medical matters as well as issues of the heart and, if there is any belief in it, the soul. "Love and live in the light," Aislinn's mother used to say, "do not be afraid or hide in the dark," and after her death, Aislinn adopted these words as her own. She places more value in kindness and compassion than she does material wealth or power, and shows them as freely as she laughs, which is often but not very loud because her voice is naturally soft and her demeanor sometimes gives the impression that it might cause her physical pain to raise it much higher. As a child, she was taught to be dutiful and polite, and as an adult she makes an effort to treat others with respect regardless of how she is treated, and to use her gift to save lives even when those lives belong to people she doesn't necessarily like. Her personal code of conduct prevents her from withholding help from anyone if she's in a position where she can give it, and under no circumstance will she kill another human being when there are alternative solutions. Aislinn is more likely to tell half-truths or confabulations than she is to lie outright, partly because she's no good at it and partly because she feels the same way about dishonesty as she does about deliberate cruelty and the exploitation of the weak — and it's important to note that she belongs to this category of people and is generally too submissive to stand up for herself or her beliefs. When under pressure, she tends to yield rather than push back. She strives to maintain a good work ethic at all times, and in most matters where other people are relying on her she succeeds, but Aislinn also has a tendency to get distracted and forget what she's doing if it isn't important. Her father used to accuse her of daydreaming too much, and while she's long since outgrown the childish flights of fancy of her youth, it isn't uncommon for her to wander off on a whim without telling anyone where she's going or when she'll be back. She enjoys long walks in the hours right before and after the dawn, and philosophizing about things like whether or not trees remember and how long it would take them to forget if they do. 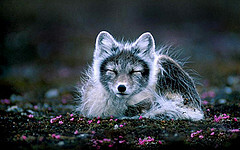 Aislinn's familiar, Hush, in arctic fox form. Aislinn's magical gift is one of empathy — it allows her to sense what people and animals are feeling both physically and emotionally, as well as providing her with unique insight into their spiritual composition and the events that surround them. However, like a watercolour painter with a limited palette to choose from, what information Aislinn can glean through the practice of magic is restricted to the expression of finite details; she might get the impression that an individual isn't trustworthy, but she would not know why or under what circumstances; her heart might tell her that the patient she is trying to save is close to death, but she will not be able to predict when exactly they will pass; a newborn baby might have an aura that suggests it will one day be destined for greatness, but she could only tell its mother that it would be wise for her to consult a prophet; she may wake up with aching bones and what feels like a knot in her belly and decides it means that something bad is going to happen to someone that day, but anyone is as qualified to guess who. The closest she can come to reading another person's thoughts is forming vague ideas about their fears and desires, and while she might be able to use this in conjunction with the individual's emotional and physical state to predict what they may or may not do, the lack of specificity means she cannot do so reliably and is often wrong. She is more likely to be right the closer she is to the individual she's attempting to read and the longer she has known them. A family member's suffering is always more acute than a stranger's, and she can intrinsically sense when her loved ones are in immediate danger or if they've passed on no matter how far away she is at the time. This connection is strongest with her deaf son Colm and has helped her teach him how to effectively communicate with the hearing world and overcome some of the obstacles that other children his age are not faced with. Her sensitivity affects not only her bedside manner and her relationship with Colm, but also the way she interacts with animals as well, and although a scholar might not consider her influence over them true wild magic, her understanding of their behaviour based on what she can read of their temperament gives her a knack with the domesticated species that inhabit Dornie, including her husband's Shire horses. Aislinn's perception of the world and those who inhabit it is simply different. She dreams in metaphors. Her familiar spirit is named Hush.